We destroy all data before recycling. We destroy all hard drive data & media before recycling. At California Electronics Recycler we use the best data destruction wiping software to make data unreadable by even the most advanced technologies. We use techniques that are Department of Defense compliant for hard drive and electronic media destruction. Your data is destroyed and irrecoverable… PERIOD! Many recycling centers offer data destruction but not all of them can effectively keep their promise. At California Electronics Recycler we have destroyed data on tens of thousands of hard drives and devices. We know the proper techniques to handle and dispose of precious data. We know how important your business’ data is to you and your company. Your hard drives store everything, including records of every kind, social security numbers, addresses, bank account information, dates of birth, branding information, health records, client and employee information and more. The best form of security after replacing your IT assets is to have the data permanently destroyed by a reputable Data Destruction company like California Electronics Recycler. We offer several methods of data destruction that match the level of security appropriate to your needs. We can provide some FREE Data Destruction services because we have a thorough and comprehensive system to do so in an economical fashion. When customer needs dictate that we deviate from our standard services and “Certify” this Data Destruction, then our fee based Certified Services apply. 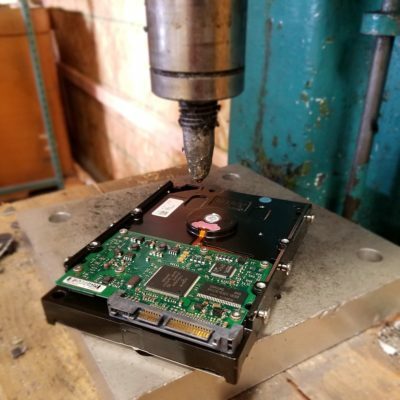 As part of our FREE services we use our professional expertise to select physical destruction, data wiping, and/or degaussing as the method of Data Destruction. No data containing devices leave our facility without Data Destruction. What happens after data is destroyed? After electronics go through the process of data destruction at our certified recycling facility we either re-purpose the hardware or continue the destruction process with one of our R2 downstream vendors. Our R2 Certified vendors break down and separate the metals and plastics in the electronics and carefully dispose of the harmful materials. It is sometimes possible to recover some of the cost of disposal through the redistribution of these recycled materials. Call us today at (800) 282-3927 or Email us at info@carecycler.com to arrange for the Data Destruction of your Hard Drives, Tapes, and other media.